Happiness and hope for better days surrounded the tomato farmers of Chittoor and nearby areas in Andhra Pradesh last year, when the central government hand-picked the district for its One District One Product (ODOP) scheme. The project was announced after Finance Minister Arun Jaitley, in his 2018 Budget speech, said the Centre will support the production, processing and marketing of tomatoes, onions and potatoes. But the current market conditions show there is little reason to be gung-ho about ODOP. Chittoor, the largest producer of tomatoes in the country, houses Asia’s biggest tomato market. The yard in Madanapalli division, that can hold 800 tonnes tomatoes per day, often has to accept a good 1,684 tonnes. It sends the produce to Madhya Pradesh, Rajasthan, Telangana, Tamil Nadu and Delhi. To help the farmers in post-harvest activities, ODOP aims to develop farmer producer organisations (FPOs), agrilogistics, processing facilities and professional management. Andhra Pradesh will help in the capacity building of 15,000 farmers who are part of FPOs. “We will provide 20 refrigerated trucks to FPOs to transport tomatoes to godowns,” says Y S Prasad, chief executive officer of Andhra Pradesh Food Processing Society. Storage facilities of 5,000 tonnes each will be set up in Rajamahendravaram and Vijayawada in Andhra Pradesh, and in Tamil Nadu and Karnataka so that farmers can wait to get better price for their crop without the danger of crop damage. Nurseries will be set up to produce quality seeds. Andhra Pradesh also plans to start an online trading platform. “The total cost of ODOP in Andhra Pradesh is Rs 110 crore. In early March, the Centre allocated Rs 50 crore to the state,” says Prasad. Despite government efforts, the state’s farmers are struggling to get minimum returns from the crop. Mass-scale dumping of tomato pulp by China has left little room for India’s tomato industry to grow. The horticulture department is now encouraging tomato farmers to shift to other crops. “We cannot compete with China,” says V Pradeep Kumar, technical director of Varsha Foods based in Renigunta, Chittoor. “Our units can process only 10 to 15 tonnes of tomatoes per hour. Chinese units can process 300 to 400 tonnes per hour,” he says. The entire process of tomato harvest in China is mechanised. So their pulp is cheaper in India despite a 35 per cent anti-dumping duty on it. Varsha Foods no longer grows tomatoes suitable for making pulp, and has diversified into making fruit concentrates and pulp. Tomato production in China is much more organised. Farmers there are made to produce as per the needs of the industry. It cuts costs. In India, making pulp is viable only when crops fail in China. “The current tomato price of Rs 8 per kg does not help,” says G Chandra Sekhar, general manager, Capricorn Foods. His plant in Satyavedu, Chittoor, is far from tomato producing areas. He makes pulp when the tomato prices are low. But his customers prefer to import cheap pulp from China. “To compete with them, we need tomatoes at Rs 4 per kg,” he says. It is important that farmers here grow processable tomatoes. At present, 80 to 90 per cent of the tomatoes are the table variety, which is not good for making pulp. Farmers in Chittoor, especially in Madanapalle, want to grow tomatoes because of suitable climate. The scope for profit is faster and more than in any other crop. 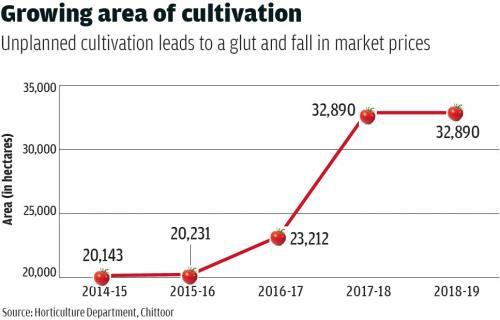 This is why acreage under tomato has increased by 63.3 per cent in the past four years (see graph). But unplanned cultivation has turned it into a gamble. The return from one acre (0.4 hectare) crop can range from Rs 6 lakhs profit to a loss of the entire input cost. “Farmers should be educated to avoid a glut and the consequent fall in market prices,” says R Gurrappa Naidu, former chair-person of Madanapalli market yard. A planned, co-opted approach seems unlikely with distrust among farmers for the industry. Sekhar says his company gave farmers inputs to grow quality tomatoes, but they did not give back the harvest. This is because the pulp industry forms a syndicate and reduces prices when production is good, counters M Gopal Reddy, head of the Federation of Farmers Associations. The government gives subsidy in drip irrigation to help farmers grow tomatoes. “But there is no monitoring of its produce,” says S Umadevi, horticulture officer, Madanapalle. As the government has no plans to set up pulp-making units, it leaves the field open for entrepreneurs ready to take risks. A farmer does not have the where-withal to spend heavily on inputs, which could cost as high as Rs 180,000 per 0.4 hectare. Small private players are now leasing land to grow tomatoes. The cost of tomatoes can fluctuate from Rs 80 and Rs 2 per kg. “In 2017, it cost Rs 80 per kg, while in 2018 it ranged between Rs 10 and Rs 2,” says S Narasimha Reddy, a farmer in Madanapalli. Private players can afford losses, but poor farmers cannot. To counter the challenges, it is important to build a value chain for tomatoes. Farmers should be encouraged to form FPOs. “Unplanned production results in wastage of 20 to 40 per cent of the crop,” says P Bhaskar Rao, president of Andhra Pradesh Food Processing Industries Federation. Just like paddy, there should a minimum support price for tomato. GST on pulp should also be removed, he says. The mantra to solve farmers’ woes is to build godowns, provide value addition to crops and improve coordination between production and demand, says K Kumar Reddy, vice-president of Andhra Pradesh Rythu Sangham, Chittoor. Farmers must form cooperatives to ensure that benefits do not go only to companies, he says. Only education on these fronts can take farmers on the recovery path.